Kentucky continued to climb at $12.4 Billion in Aerospace and Defense Exports during 2018! Once again Kentucky is 2nd in the country in exports behind Washington state. Aerospace and Defense employment also grew to 19,000 jobs. 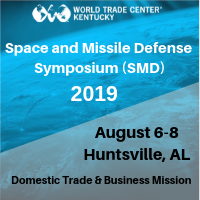 The Space and Missile Defense Symposium is the leading event in the space and missile defense community. The symposium is widely attended by leaders and professionals from the United States and our allies around the world. It is the ideal forum for conducting business face-to-face. Participants can also earn continuing education credits. Click here for more information on the Symposium. "Huntsville has created a model for the development of an aerospace and defense ecosystem. As Kentucky continues to rise in aerospace manufacturing and exports we look forward to making connections and determining best practices for our industry moving forward."